Celebrating their golden anniversary in style, Princess Cruises have lined up a series of exciting events throughout 2015 to mark 50 years on the seas. Founded by Stanley McDonald, Princess Cruises have been at the forefront of the evolution of the cruise industry since the 1960s, leading innovation and helping to bring cruise holidays to the public’s attention. 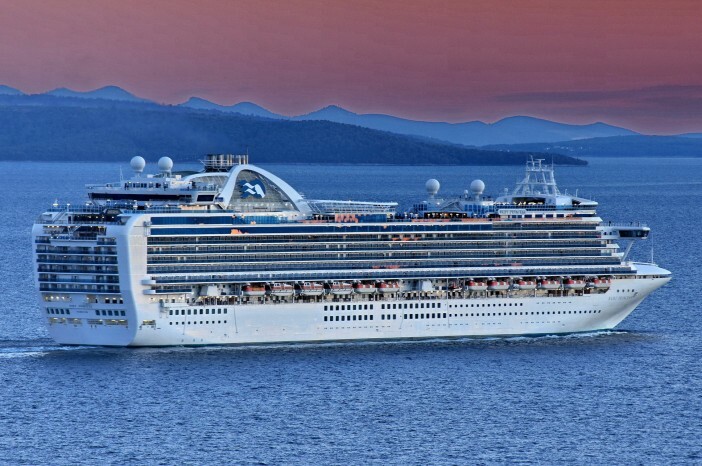 Princess Cruises humbly came into existence in 1965 when founder Stanley McDonald chartered the Princess Patricia from Canadian Pacific Limited’s now defunct shipping firm. Princess Patricia was being used to offer summer cruises around Alaska but since such trips were nigh-on impossible in winter, McDonald was allowed to charter the ship to offer winter cruises down the western coast of Mexico. McDonald even coined the name ‘Mexican Riviera’ for the route his first Princess Cruises ship sailed – a name now universally recognised. He originally aimed to corner the winter cruising market as the majority of fleets hibernated during these months. Although the Princess Patricia was eventually returned to Canadian Pacific Limited, McDonald had been inspired by his venture’s success to source specially-designed cruise ships – starting with the Italia which operated under the Princess Cruises brand between 1967 and 1973. Over the next decade, Princess Cruises added another four ships to the fleet: Princess Carla (1968-1970), Island Princess (1972-1999), Sun Princess (1974-1989) and Pacific Princess (1975-2002). In 1977, the whole dynamic of Princess Cruises and the entire cruise industry shifted as US sitcom, The Love Boat, debuted. The show revolved around the lives and loves of a cruise ship captain and his crew. The series was filmed aboard a series of cruise ships but was most notably and prominently filmed aboard the Pacific Princess, Island Princess, Royal Princess and Sun Princess. The series ran for nine series and 249 episodes, beamed into the homes of people all around the world. Showing the luxurious and glamorous side of cruise holidays, The Love Boat, was syndicated in 28 different countries with dubbed voices and/or subtitles. By the time the show ended in 1987, it had been seen by millions of people and influenced endless holidaymakers to take their vacation at sea. The line continues to grow in fleet size, ship size and innovative features. One of the landmark features of the fleet, Movies under the Stars, launched in 2004 – giving passengers the chance to watch classic films and new releases on the top deck of the ships in the evenings. Take a look at our infographic, which we put together to celebrate the past 50 years of Princess Cruises! The special events for 2015 began on 1st January, when the company entered a float in California’s famous New Year Rose Parade. The theme of the parade was ‘Inspiring Stories’ and Princess Cruises decided to share the story of how Stanley McDonald turned one charter ship into a huge multinational company which transports nearly two million passengers every year. For over a century, the Rose Parade has welcomed in the New Year in California, with upwards of 700,000 attending and roughly 700 million others watching at home. The sunny Californian weather makes it an ideal place to hold the parade with much of the rest of the country buried under snow and sludge on 1st January. The six main characters from The Love Boat were invited to ride along with the float, to celebrate the influence the show had on Princess Cruises’ evolution. Gavin MacLeod (Captain Stubing) Fred Grandy (Gopher, the chief purser), Ted Lange (Isaac, the bartender), Bernie Kopell (Doc, the ship’s doctor), Lauren Tewes (cruise director Julie) and Jill Whelan (Vicki, the captain’s daughter) were reunited by Princess Cruises once again to celebrate the cruise industry. On 3rd December the Pacific Princess will undertake a nostalgic cruise trip which mirrors the journey made by the very first Princess Cruises trip – taking in many of the same ports of Stanley McDonald’s 1965 cruise. The 14 night cruise will visit the Mexican ports of Puerto Vallarta, Manzanillo, Mazatlan, La Paz and more in a route almost identical to the original Mexican Riviera cruise. Alongside sister ship, Ocean Princess, the Pacific Princess is the smallest ship in the Princess Cruises fleet – a conscious decision by the line to help recreate the atmosphere of the 1965 trip. The 670 passenger capacity cruise ship is more reminiscent of the ships operating in the 1960s than the large megaships which make up much of the modern Princess Cruises fleet. Looking to the next 50 years, Princess Cruises will significantly extend the number of itineraries offered by the fleet, visiting 140 different destinations in 70 countries across six different continents throughout the 2015/16 season. For the first time ever, five of the 18 ships in the Princess Cruises fleet will call Australia home as they are positioned across four different ports. The ships will offer a variety of different cruise itineraries, sailing throughout Australia and New Zealand and to the islands of the South Pacific and the cultural cities of Asia. One of the undoubted highlights of Princess Cruises’ year will set sail later this month as the Pacific Princess World Cruise launches on 23rd January. The 111 night cruise takes in five continents and innumerate counties during three and a half months at sea, even crossing the International Dateline (effectively missing out 2nd Feb). Regarded as one of the world’s most respected and best loved cruise lines, Princess Cruises now have to work on making sure the next 50 years are as successful as they look to celebrate their 100 year anniversary.